When I recommend meditation to my stressed-out friends, they often open their eyes wide and scrunch up their nose. I understand. When you think of meditation, the first image that comes to mind is probably a yogi, sitting with a straight spine in front of a peaceful lake, fingertips touching. But in reality, meditation can be a much broader practice. For beginners, and even for folks who are used to having a spiritual practice, I always recommend meditations of simple mindfulness rather than a classic seated meditation. Trying the 100 breaths technique. This is a highly complex meditation technique! I take 100 breaths. I count them. I try not to think about anything else. Yup. It’s revolutionary. And it also really works for me. It gives my brain something to do (wee! counting!) while the rest of me is just hanging out, inadvertently meditating. Try to hear every instrument in the band. Separate the lyrics from the melody—listen to something instrumental, if you can. Sing along, and feel your body vibrate with the hum of sound. Get ready to boogie—meditation just got a soundtrack! Most people, at one time or another, have put on some tunes and cut the rug to chill out after a tough day. Dance or kundalini meditation takes that release one step further by asking participants to let go of the ego and surrender to the rhythms and ecstasies of movement. I imagine that, like me, you drink something every morning. Instead of just tossing it down like a shot at the bar, drink it slowly. The practice alone will bring about a beautiful sense of presence in your life. The practice of painting, or drawing, or sewing, or gluing magazine strips to paper is incredibly meditative. Set aside a bit of time for art, and as you work, make sure that you’re truly there with your project. Keeping a diary or journal is a great mindful practice. Mindful journaling is slightly different from your typical journal. When writing in a diary people typically record and reflect on the events they experienced that day. Mindful journaling is specifically used as a tool for reflection and growth. Writing with pen and paper keeps you from becoming distracted by the Internet. It also helps keep your mind sharp by improving motor-skills and memory. It can also help you further connect with your words and feelings. This is one of my favorites. Cooking can be an incredibly powerful act of meditation. Grind your own spices, chop vegetables with a smile, and put love into your pot. Not only is eating mindfully a simple and delightful act, but it’s much healthier than shoveling food down while you’re running to your next meeting. Take time to feel the temperature of your food with your fingers, feel the texture, smell all of the ingredients. Be there with your food before you eat. Use the alarm clock meditation. Set a timer. Then meditate until the timer goes off. This way, you don’t have to wonder about how long it’s been, or how much longer you should meditate for. It’s like meditation on cruise-drive. 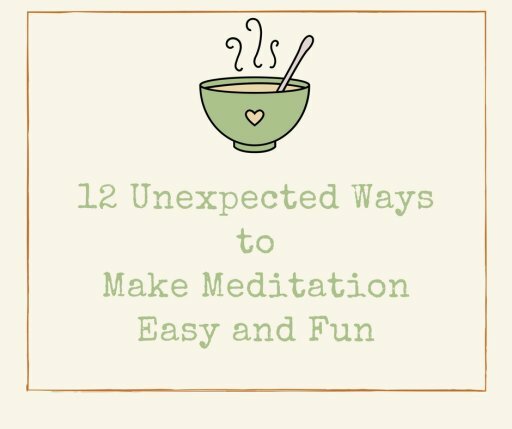 I’ve recently gotten into yoga and meditation and it has been really helpful for me, but thank you for the new suggestions on other ways to relax. I like using exercise as meditation. Swimming, running or even bodyweight exercises. I will have to definitely try this as I (sadly) fit into the category of people who struggle to meditate! Love love love. Thank you. I’ll have to try the 100 breath meditation.? This is fantastic. The techniques are simple but so powerful. Apart for the 100 breath meditation that should be advised to be done in a place where you can sit to avoid hyperventilation which is the first of the beginners issue with meditation, the rest of the ideas are just great. I love the “make art” one… It’s something I teach a lot and not that much people understand. Good post! Seems like there is something for everyone to try. Very good post. Thank you for sharing. On my journey, I’ve embraced Buddhism as a philosophy, not a religion necessarily. The more I read, the more important I find meditation on the road to mindfulness. The misconception that meditation requires one to think of “nothing” is difficult one to overcome. The one piece of advice I might put out there is to look at some of the meditation apps. There are a few that have been very well-received by those in the know. In my case, I am a big fan of “Headspace” but there are a bunch out there.